What's the best advice for finding cheap Mustangs ? Look everywhere! I know that sounds ridiculously obvious, but the reality, is, most of us don't actually follow that simple advice. We look in the classified's section of the newspaper. We look at the bargain paper and if we know about it, we'll check our local craigslist. But what's it worth, to save $500 bucks, or maybe several thousand? If I can save a grand or two, I absolutely will, travel to other states, provinces, or cities to get the cheapest Mustang, if it makes sense. That may sound expensive, and even a lot of work, but it can spell big rewards. While things have changed over the years in the places we find cars, the one constant, is that for the best deals, you have to be able to act fast. Good, cheap Mustangs will sell fast. Whether its Cheap classic Mustangs or a new Mustangs for sale, you have to be ready to pounce. I found out who the owner was, contacted her and agreed on a price. After renting a trailer, grabbing a buddy and heading back across the border a week later, it turned out to be a dud... two hundred miles from home. And on seeing it up close and personal, I realized that there was no use even bothering. Annoyed at myself, and with nothing else to do but drive back, I stopped into some local businesses, explained that the car I came out for, had bullet holes and all the important parts long gone and asked if they knew anyone who might have something like what I was trying to find. Turns out the guy at the store had a very low mileage and cheap classic for sale and I had a car trailer... hmmm. Mustangs, would you say, it's not worth a 2 hour drive? Not likely. so why not search out of your area now? Don't forget about buying a salvage Mustang. 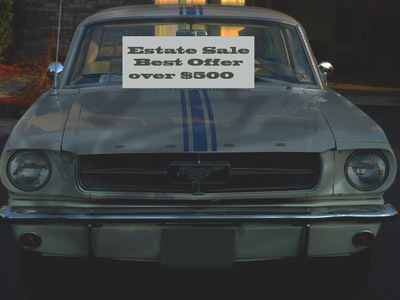 If you were buying a newer car and thought about finding a better deal, by rebuilding a Mustang with a salvage title, I might think twice, but if you're looking for a classic Mustang, things may be different. Early cars have less electrical things to go wrong, and may be the way to finding cheap Mustangs for restoration. Here's why. Instead of looking for a cheap car that runs well, you could be instead looking for a good restorable Mustang. Here's where something like a flood car might just be the ticket. Treat it just like some old clunker that needs work and offer that kind of money. That way, you could end up with maybe a car with great body work (it was restored before the flood) but needs things like new upholstery, carpet etc. Things you'd normally be in for anyway. The point is, to be successful in finding cheap Mustangs or any other classic, you need to think out of the box. Of course then it's time to find cheap classic car insurance.